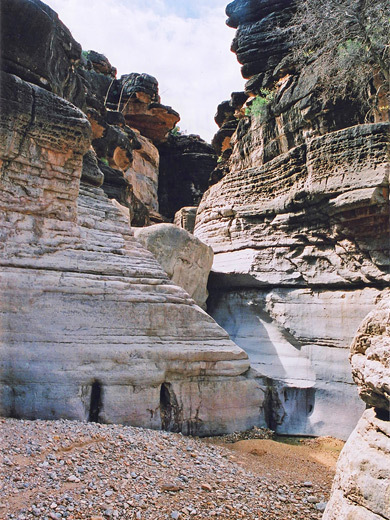 Hindu is another romantically named canyon in the vast, empty lands of the Hualapai Indian Reservation in the southwestern Grand Canyon corridor, and as with Milkweed and Meriwhitica it is a tributary of Spencer Canyon, which meets the Colorado at river mile 444. 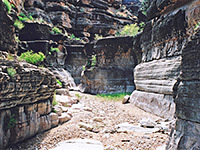 Like all canyons in this remote area, Hindu is very little visited, completely unspoilt yet easy enough to reach, though only a short part has nice narrows; most of the upper reaches are wide, grassy and with gently sloping sides while the lower part, after a big drop off, is deep but open. The slot-like section is about half a mile long, where the drainage cuts down into the thin strata of the Supai formation, and has a sequence of beautiful narrows, pools, chutes and cascades. A permit is needed for all camping/hiking anywhere on Hualapai land, and if available this may be obtained from the Hualapai Lodge, in the tribal headquarters town of Peach Springs. In recent years however, since the opening of Grand Canyon Skywalk, access to the backcountry of the Hualapai Reservation has been restricted, and Hindu Canyon may no longer be accessible. It is best always to check at the lodge in person, to enquire about the latest regulations. 12 views of Hindu Canyon. The trailhead is 15 miles northwest of Peach Springs on old US 66. The directions from the town center are to drive west to between mileposts 100 and 101 and turn right along the Buck and Doe Road (Indian Reservation Route 1), which is paved for a few miles then good quality gravel. After 6 miles, the road passes under some powerlines then, just beyond a cattle grid, a narrower, unsignposted road branches off due north. This is a smooth dirt track, generally good for any vehicle, though not after wet weather, as demonstrated by deep, dried ruts at either side. The long straight road passes an airstrip on the right and forks just before a small, often dry reservoir, enclosed by a fence. The right fork, now very little used, passes a gate and crosses more big empty land (Plain Tank Flat) still without any sign of the great canyons ahead, though the terrain does start to become rockier about 2 miles from the edge of the plateau, at the rim of Hindu Canyon. Low clearance vehicles might have to be parked somewhere along the last mile or two before the rim, though the track does continue for another 12 miles - it descends into middle Hindu Canyon, follows it downstream for a way, climbs up the far side and ends at a viewpoint 3,400 feet above the Colorado River, opposite Separation Canyon. But the last few miles are for hikers only as one section of the road is completely washed away, and even the descent into Hindu is narrow, steep and rutted, so the best parking place is just by the rim. TopoQuest topographic map of Hindu Canyon. 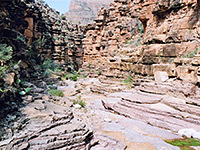 From the edge of Hindu Canyon, the track winds down a side drainage and on to the floor of the valley, following it along the south side. 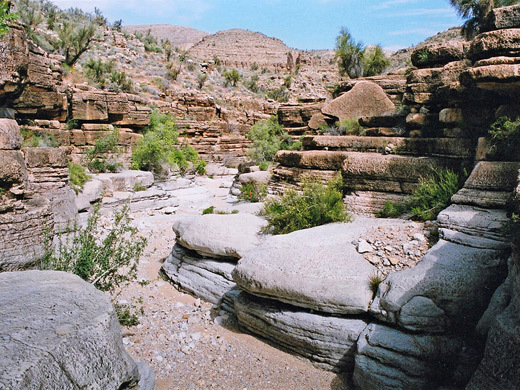 The canyon at this point is U-shaped, bordered by smooth, rounded hills bearing scant vegetation, though cliffs and rocky outcrops develop a couple of miles downstream, and the dry streambed starts to become enclosed. 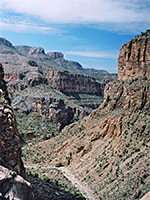 The track crosses over to the north, rises to pass a cliff-bound section, returns to stream level for a while then bends away north towards Bridge Canyon and the viewpoint of the Colorado River. 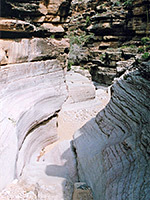 Continuing downstream, the streambed is still mostly level but soon begins to drop down in a series of steps, over successive limestone layers of the Supai formation, as the walls rise up at either side. The best, narrowest part is quite short, and starts with some steeper drops leading to a series of rounded chambers, smooth chutes and narrow channels, all enclosed by stepped, vertical walls that are white, smooth and water-polished at creek level, and stained black higher up. Bright green bushes provide a striking color contrast. The slot soon opens out a little but remains pretty, and a small stream flows intermittently, through trickling cascades and shallow pools that in season are full of frogs and tadpoles. On the left side, a dripping spring above an alcove in the canyon walls provides nice-tasting water. After two more bends, a sheer 300 feet drop off marks the abrupt end of the narrows (at the edge of the Redwall Limestone); far beneath, the canyon is much wider, and soon meets the even larger Spencer Canyon. All this area feels especially remote - once over the rim of Hindu Canyon, there is only the very faintest sign of a vehicle ever having driven along the access track, and no footprints anywhere. The distance from the edge of the rim to the drop off is about 6 miles and a round trip takes from 5 hours - a generally easy hike with no obstacles.